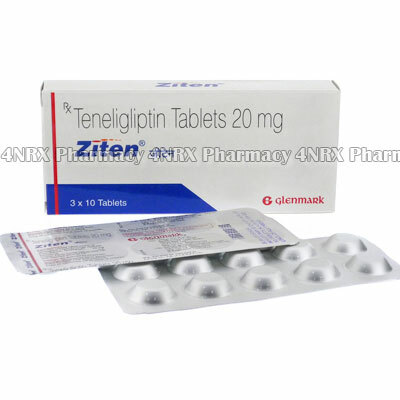 What is Ziten (Teneligliptin) used for? How should I use Ziten (Teneligliptin)? Different people may need different dosages depending on the results of blood tests taken before treatment begins. A dosage of one Ziten 20mg tablet each day is often prescribed. Blood tests will be needed during treatment to ensure glycemic control is being maintained. Ziten dosage can be increased as high as 40mg per day if needed. What are the side effects of Ziten (Teneligliptin)? The major two side effects reported with Ziten use have been hypoglycemia and constipation. If you notice a rash, difficulty breahing or any other signs of allergic reaction to teneligliptin, contact your doctor immediately. Teneligliptin is a very new drug, with minimal clinical trials. Some potential risks may not have been realised. Your doctor will be able to advise you if teneligliptin is a suitable drug for your condition. When coadministered with another antidiabetic drug, Ziten (Teneligliptin) can increase the risk of a hypoglycemic reaction. There is a possible risk of intestinal obstruction due to the mechanism of action of teneligliptin. Patients with a history of intestinal obstruction or abdominal surgery should use teneligliptin with caution and under medical supervision.